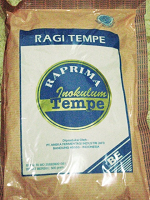 Tempeh, is a traditional soy product originally from Indonesia. It is made by a natural culturing and controlled fermentation process with Tempeh Starter, that binds soybeans into a cake form, similar to a very firm vegetarian burger patty. 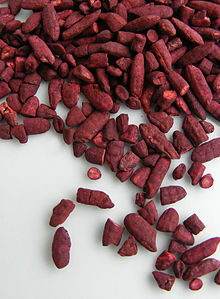 Tempeh is unique among major traditional soy foods in that it is the only one that did not originate from another cuisine. It originated in todays Indonesia, and is especially popular on the island of Java, where it is a staple source of protein. Like tofu, tempeh is made from soybeans, but it is a whole soybean product with different nutritional characteristics and textural qualities. Tempeh fermentation process and its retention of the whole bean give it a higher content of protein, dietary fiber, and vitamins. 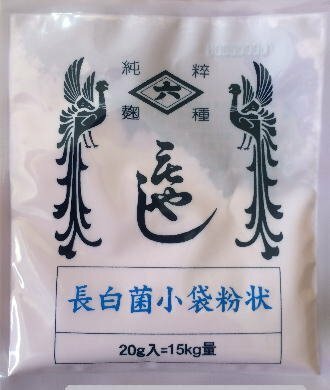 It has a firm white texture and an earthy flavor which becomes more pronounced as it ages. Because of its nutritional value, tempeh is used worldwide in vegetarian cuisine, where it is used as a meat analogue, and contains the needed vitamin B-12 which is produced natural due the fermentation process. Our tempeh starter is design to process less black spores, in order to give it a perfect white appearance. Our starter kit produces more then 25 lbs tempeh, our prices are the best, shipping is cheap. Now you can make your own Tempeh, just order our Tempeh Starter, we include clear instructions. Shipping is reasonable cheap, and soon you will be eating your own tempeh. We are, for many years now, a top selling company of Tempeh Starters, and other fermentation starter products. We ship worldwide. All Mayor Credit and Debit Cards, and Paypal payment are accepted. Our shipping prices are very compatible, and our starters have more potentcy then other simular products. Just try us out, and you will not be disapointed.